It takes something extra for a salad to still my hunger. This very tasty mustard marinated salmon salad satisfies my appetite on its own. OK, if I’m really hungry I might also have some sourdough bread together with the salad, preferably with a bit of avocado on top. The marinade for the salmon is simply gorgeous and adds extra oomph to the salad. 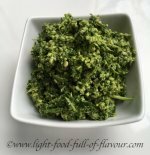 As it is the season for asparagus right now, I am adding this and tenderstem broccoli (broccolini) to this mustard marinated salmon salad. You can use green beans instead of asparagus. I admit that when I’m not living by the sea – where I’ve been spoiled by such fantastically fresh fish - I eat more salmon than any other type of fish. Not that this is a bad thing as it’s good to eat oily fish containing omega-3 several times per week. Note about cooked vegetables: I’ve started to steam my vegetables as often as possible as you lose more vitamins from the vegetables when boiling them. I use an inexpensive, foldaway stainless steamer basket that fits into a couple of my pots with tight-fitting lids. 1. Pre-heat the oven to 200C/fan 180C/400F/gas mark 6. Put one pan of water on to boil for the eggs and another one for your vegetables. Place the salmon fillets in an oven-proof dish. Mix together the ingredients for the marinade and divide it over the salmon fillets. Season each fillet with salt and pepper. 2. Boil your eggs. Toss the tomatoes in a little bit of olive oil, add them to the dish with the salmon and place it in the oven. Cook the salmon in the oven for 10-12 minutes - or until cooked through. 3. While the salmon is cooking, boil or steam the asparagus and tenderstem broccoli (broccolini) – I steam them for about 3 -4 minutes, depending on the thickness of either vegetable (check with a sharp knife). Peel the eggs and cut each egg into quarters. Mix together the ingredients for the dressing. 4. Divide the lettuce between four plates and top with asparagus and tenderstem broccoli. 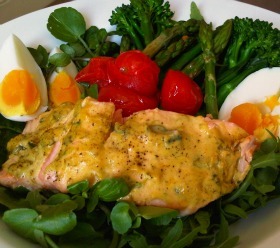 Drizzle some dressing over each portion and top with a fillet of salmon, tomatoes and four pieces of egg.